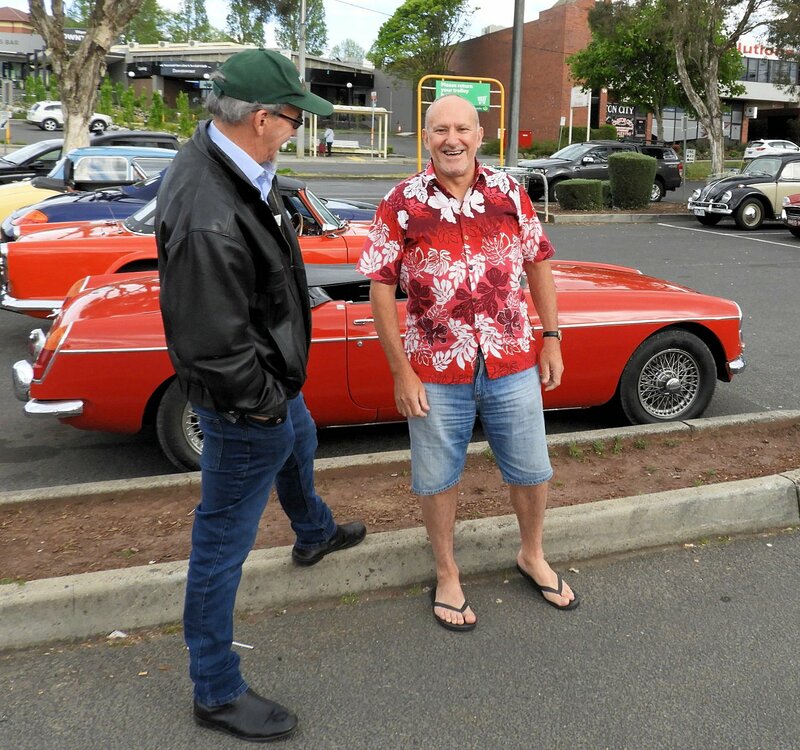 BREAKFAST CLUB, Warragul CBD – Sunday 14th Oct.
Hawaiian shirts, shorts and thongs may be unusual attire for a pleasant Spring morning in Warragul, but it was obvious by the huge turnout of convertibles this m onth that Summer isn’t that far away. Daylight Saving also doesn’t seem to have affected the early bird arrivals, Ian and Mary Hodge drove down from Melbourne in their recently Club-plated Citroen DS, arriving almost an hour early. The Citroen obviously cruises a fair bit quicker than Ian’s MGTF, so they had plenty of time to enjoy a feed at Frankies before the crowd arrived. Your correspondent also arrived early after giving the Z4 a quick hose down and chamois at the car wash to remove the remains of splattered bugs gathered the previous morning on a Bimmer Club run through the Yarra Valley. At 7:30am there were around a dozen vehicles already in position with more arriving every minute. With well over a hundred sports, classic and collectible cars on display throughout the morning, this month’s event was up there as one of our largest turnouts, and the car park was buzzing with activity. As usual, the diversity of vehicles was just as interesting as the vehicles themselves. From the stately English classics from Rolls Royce and Bentley to a tiny Austin 7 Special; from a Willys Jeep to a V12 Aston Martin Rapide there was something to interest everybody. As usual there were several cars making their debut appearances as well as some that were being offered for sale. A couple of first-timers that particularly caught my attention were Cliff Holton’s stunning British Racing Green, Series 1.5 E-Type Jaguar and a rare little Riley Elf from the 1960’s that was marketed as an up-market version of BMC’s Mini, complete with generic Riley grill, wood-grain dash and an extended boot tacked on the back. This month vehicles with an English heritage seemed to outnumber all others – with MG, Austin, Leyland, Austin Healey, Triumph, Daimler, Sunbeam, Jaguar, Morris, Riley, Rolls Royce, Bentley and even a Bayliss-Thomas. There were plenty of German makes and models scattered around – a couple of VW Beetles, Z3 and Z4 BMWs, Mercedes SLs and a pride of Porsches this month including four Boxster’s, a couple of 911s, a Cayman and a 944. Italian marques were less prevalent, but just as spectacular with several Alfas, a Maserati and Mark Sanford’s beautiful mid-engined Lancia Montecarlo. American muscle included a big-block Pontiac Firebird that looked as if it came straight off the set of Smokey and the Bandit, a tidy 50’s Chevy and an early Corvette that sounded magnificent. Several classic Mustangs offered a visual contrast to the single late model offering in an unusual, but very attractive burgundy paint job. A pack of MX5s and a couple of Nissan Z cars flew the flag for Japan and Australian makes were well represented with a range of late and early model Holdens, a couple of Fords and Bob Russell’s VE Valiant.